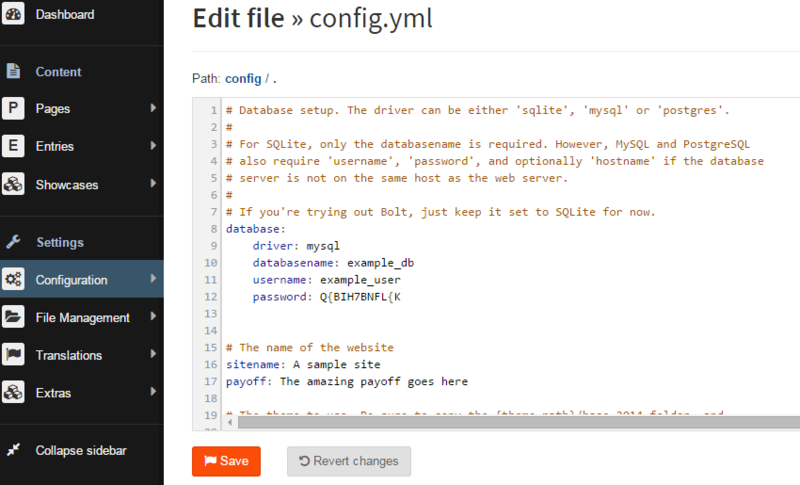 There is an option to configure your Bolt installation with a MySQL database. This is an optional step, but if your project is going to be vast in size, we strongly recommend that you set up your website with a MySQL database. It is much more reliable and you can easily perform changes to the database directly from the phpMyAdmin service in cPanel. In this tutorial, we will follow the process of reconfiguring your Bolt installation with a MySQL database. Log into your website with the user that you have created in the previous step. You will be presented with the default dashboard of your Bolt website. Go to the side menu on the left, and hover over the Configuration tab. Select Main Configuration from the available options. This will send you to a page that allows you to directly edit the config.yml file. This is the file that is responsible for the configurations of the application. Now you should directly see that the database named ‘Bolt’ is configured with the SQLite driver. In order to change Bolt to use the MySQL database driver you would first have to create a mysql database and database user. Driver - Enter "mysql" without the quotes. Databasename - Enter the name of the MySQL database you have created. Username - Enter the username that you have assigned to your database with all privileges. Password- Enter the password for the user. When you are ready, simply click on the Save button to keep the changes. When you complete the change, you can click anywhere on your admin dashboard. The system will take you back to the user creation page, as you have changed the Bolt configuration settings. You now need to create a new user, which will be stored in the MySQL database. Fill in the details, click on the Create the first user button and you will be able to access your website again.